With a 'flat' volts/amps characteristic an attempted alteration in arc length (volts) will have little effect, hence arc length (volts) remains constant but a significant change in current will result. This is often referred to as the 'self-adjusting arc'. Metal Inert Gas (MIG) welding is a 'flat' arc process (constant) voltage. Also known as Metal Active Gas (MAG); CO2; Metal-arc Gas Shielded, flux core and GMAW (US). 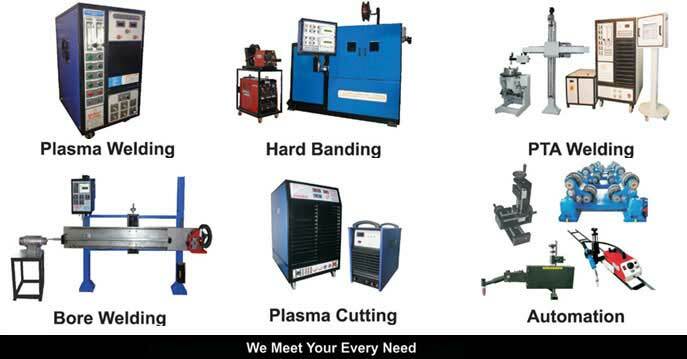 MIG can be used on all materials, in all positions, with high productivity and low heat input. There is no CO2 MIG welding with stainless steel. Normally DC positive though some flux core uses DC negative. Manual, mechanised, semi-automatic and automated (robotics). An arc is maintained between the end of the bare wire electrode and the work piece. The wire is fed at a constant speed, selected to give the required current, and the arc length is controlled by the power source. The operator is not therefore concerned with controlling the arc length and can concentrate on depositing the weld metal in the correct manner. Hence the name 'semi-automatic' for manual operation, in which wire, gas and power are fed to a hand held gun via a flexible conduit. The process can be operated at high currents (250 - 500 A) when metal transfer is in the form of a 'spray', but, except for aluminium, this technique is confined to welding in the flat and horizontal positions. For vertical and overhead welding special low current techniques must be used, i.e. 'dip' transfer or pulsed arc. The arc and weld pool are shielded by a stream of gas. 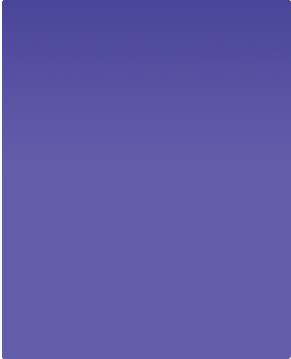 The electrode can be solid or flux cored. (In mechanised MIG and submerged arc welding the process may also be operated using constant current or drooping arc characteristics). The heat source used to melt the parent metal is obtained from an electric arc that is formed between the end of a consumable electrode wire and the work piece. The arc melts the end of the electrode wire, which is transferred to the molten weld pool. 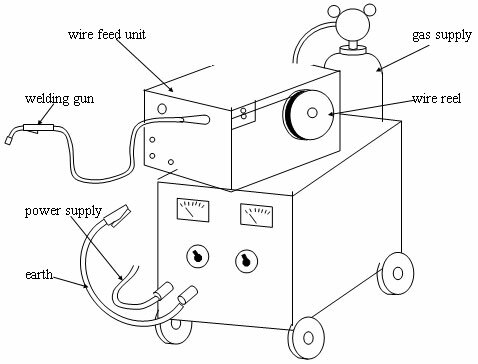 The electrode wire is fed from a spool that is attached to the wire driving system and passes through a set of rolls, which are driven by a variable speed electric motor. By varying the speed of the motor, the level of the welding current can be adjusted - high wire feed speed gives high welding current. Altering the voltage can also vary the arc length - high voltages give longer arc lengths and vice versa. In order to prevent the air reacting chemically with the molten metal, a shielding gas of either CO2 or argon/CO2 mixture is passed over the weld zone from a nozzle attached to the welding gun or torch. This protects the molten droplets passing across the arc and the molten weld pool. Electrical power for the process is a direct current that is obtained from a transformer-rectifier. The welding gun or torch is connected to the positive pole of the power supply unit and electrical contact to the wire is obtained as close to the arc as possible by means of a copper contact tip or tube. e.g., 250 - 600 Amps at 28 - 40 volts. As the current is increased the rate at which the droplets are transferred across the arc increases and they become smaller in volume. The droplets can be seen in a high-speed cine film but cannot be seen with the naked eye. It appears as if there is a spray of metal. The type of shielding gas greatly affects the current rate at which the spray transfer occurs. The use of CO2 as a shielding gas requires a much greater current density than argon to produce the same droplet rate. With the use of high currents giving strong magnetic fields very directional arcs are produced. In argon shielding gases the action of these forces on the droplets is well balanced and transfer from wire to work is smooth with little or no spatter. However, with a CO2 shield the forces tend to be out of balance giving rise to an arcing condition that is less smooth and spatter levels are heavier. Metal transfer under these conditions is normally called globular or free flight. The welding conditions that give spray or globular transfer are normally associated with high deposition rates on medium and thick sections giving high productivity. It has a higher heat input and can only be used in the flat and HV positions except when welding aluminium when it can be used in all positions. When using lower arc voltages and currents, generally in the 16 - 26 volt and 60 - 180 ampere ranges, metal transfer takes place during short circuits between the electrode and the weld pool, giving a lower heat input. These follow a consistent sequence of alternate arcing and short circuiting causing the end of the electrode wire to dip into the weld. As the wire touches the weld pool there is a rise of current, the resistance of the wire causes heating and the end of the electrode melts. The wire necks due to a magnetic pinch effect and the molten metal flows into the pool. During this short circuit period the current delivered by the power source is much higher than during arcing - typically 1000 - 1500 amps. This creates high forces that have an explosive effect on the weld pool and spatter is considerable. 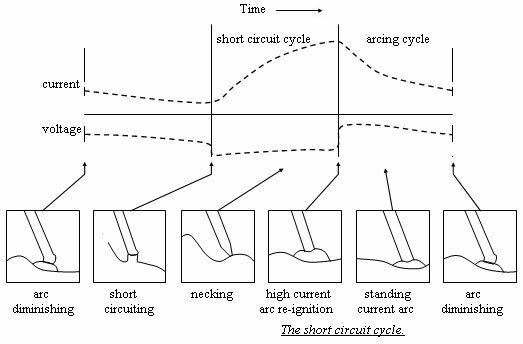 To reduce this effect an inductance is connected in series with the power supply and the arc to reduce the rate of rise of current during the short circuit period. The short circuit is cleared more slowly and gently, and the spatter is reduced to an acceptable level. Ideally the droplets are transferred in an almost irregular dip/arc cycle taking place about 50 - 200 times a second. Too little inductance gives rise to unstable arcing conditions, excessive spatter and lack of fusion defects. This is a globular transfer using medium volts and medium amperes. It is generally unusable having an unstable arc and high spatter levels. Use is mainly with flux cored wires in filling passes. This is a synergic transfer of 50 - 250 kilohertz that combines short circuit and spray transfers. It uses high and low voltages and amperages, and can be used in all welding positions on plate thicknesses greater than 6 millimetres. 1. 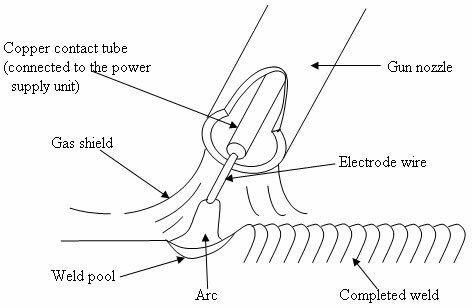 Electrode extension - affects the amperage. Stick out length should be 10 - 15 mm. 2. Inductance - ' smoothes' the arc characteristic. Also called the choke. Set low gives excess penetration and high, no penetration. 3. Wire feed speed - amperage. Controls fusion and penetration. 4. Travel speed - controls depth of penetration. 5. Gas flow rate - protects weld from atmosphere. 6. Voltage - set on the welding machine and controls the arc length. 7. Tilt angle - back or fore hand should be not greater than 15° from the perpendicular. The welding position and type of weld are further variables to be considered. Sets are manufactured in a range of sizes, identified by current, similar to metal arc welding. Currents below 200 A can only give dip transfer operation, suitable for welding steel only. Larger sets may have the wire reel and motor as a separate unit, so it can be placed near the job. Controls on the set adjust output voltage and may allow a choice of inductance. The wire speed control will be on the wire feed unit. Electrical input is from single phase 240 V mains for small sets, or three phase 415 V for medium size and upwards. Output is always DC with a flat output characteristic for semi automatic and drooping output for mechanised. Sets which supply current in pulses (at 40 - 200 per second) give improved results on some jobs. Because the 'pulse-MIG' increases the number of controls, an electronic 'synergic' control system varies all the parameters in step to simplify adjustments. Sets often have a built-in holder for a gas cylinder. A set will usually be supplied with a suitable welding gun. Heavy duty guns may be water cooled and the set may have a water tank and cooling radiator built in. When welding aluminium the wire is soft and tends to kink when pushed through a hose. A gun carrying a small reel of wire - 'reel-on-gun', obviates this. Welding cables Similar to manual metal arc - one set usually included. 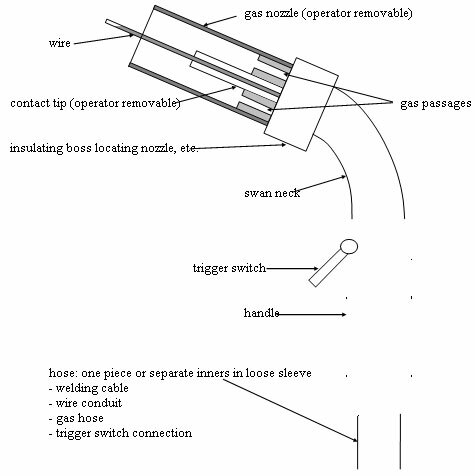 Gun and connecting hose assembly to suit current, usually supplied with set. Gas regulators and hose, connections to suit. Vaporiser for carbon dioxide gas on industrial sets. The following parts come into contact with the wire - spares are needed to replace worn parts, or if wire size or type is changed. Inlet and outlet guides On drive assembly. Contact tip in gun - needs fairly frequent replacement. Gas shielding nozzle for gun - various sizes to suit different jobs. Wire conduit liner - spring steel coil (like curtain wire) for steel electrode wire, or plastic tube for aluminium. Silica inclusions (with steel only). a. Spray transfer current too high. a. Gas flow too high or too low. e. Nozzle to work distance too long. f. Painted, primed, wet or oily work surface. g. Damp or rusty wire. c. Root face too thick. e. Worn tip causing irregular arcing. c. Rusty or primed plate. Stainless steel and nickel alloys. Some offshore applications (flux core only).